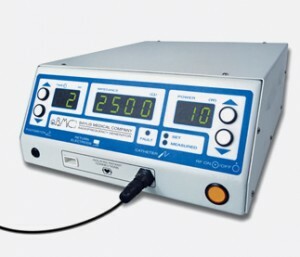 The RFP-100 Radiofrequency (RF) Puncture Generator is designed to deliver RF energy to the NRG RF Transseptal Needle. This energy lets the RF transseptal needle cut across the septum in a controlled, effective, and safe manner. The RFP-100-115 RF Puncture Generator is designed specifically to make a controlled puncture in tissue while causing little to no damage to surrounding tissue. The difference being that mechanical force is not required to push across the septum. The closure rate of the transseptal puncture with RF is similar to that of a mechanical needle.